This entry was posted on December 6, 2016 by Jessica Anderson. You have your recognition program set up, know what types of accomplishments you want to recognize, know what you want to say on the awards, and your ceremony planned. Now what? 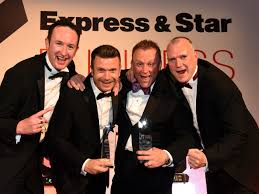 You go to our website and are overwhelmed by the hundreds of choices of corporate awards. I’m here to help! Read my top 5 tips below to narrow your search and to help you choose the perfect corporate award for your situation and accomplishment. Be sure to make the award match the occasion! #1: Start With Your Budget. Know how many people you want to recognize and the cost per person of the award. That can help you narrow your choices. We have beautiful awards in every price range, so even if your budget is small, we’ll create something beautiful for you. Read tips on Budgeting for a Recognition Program here. #2: Have The Award Fit The Accomplishment. What I mean by that is you wouldn’t give an expensive crystal award to someone for a menial accomplishment; that’s saved for those who have gone above and beyond for the organization. Conversely, if someone has worked for your organization for years and years and is celebrating a big anniversary, a $10 gift card doesn’t cut it. Make sure to match the award stature to the accomplishment. This beautiful crystal award deserves to be displayed with pride on a desk or a shelf for all to see and admire. #4: Where Will It Go? Form Follows Function. Where will your recipient put the award? On a desk? On the wall? Or on a shelf in the lobby? Is it a gift that will be displayed in the home? These are all things to consider when choosing an award. A sales award may be hung on a wall for all to see; if so, then a recognition plaque may be a good choice. 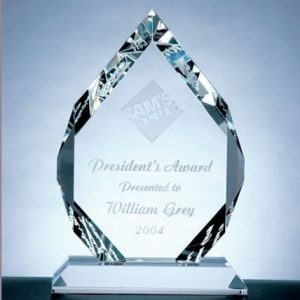 If you are honoring a past president or someone who has given service to the organization, an award that goes on a desk or on a shelf in their office is a winner. If the award is for retirement or years of service, something more functional and pretty, such as an engraved clock or personalized vase, is appropriate. This is your opportunity to get creative! If your organization is more conservative, stick with a traditional award. But if you’re in more creative place, choose something a little more artistic or funky! There are lots of unusual yet beautiful awards to choose from. If you are giving an individual award, consider the recipient’s personality and have the award match it. For example, if the person loves to fly airplanes, get a crystal plane award. Or if they are a realtor, get a house shaped award. There are lots of choices – get creative and think out of the box! Don’t hesitate to contact me if you need any suggestions or guidance when picking out awards – email is [email protected] - and I'm here to help. With thousands of choices in every budget, our awards impress and will thrill your recipient!